When we came back from our vacation from Germany, we had only a few days to get ready for Christmas Eve and Christmas. Let me tell you those few days flew! Well, I got everything together…and by that I mean food! We had to get food from after vacation, but then for Christmas Eve and Christmas. We arrived back on December 20 and by the evening December 23 I was calling Victor to come home. I felt like I had a truck run over me and I was constantly running to the bathroom. Ok-No more details. I had a horrible stomach virus for 5 D-A-Y-S STRAIGHT!!! What ever weight I gained on vacation, I know I lost it. Well, besides me being sick…. Christmas Eve was the next day. On Christmas Eve, we have a birthday party for Jesus and this is this year’s cake! 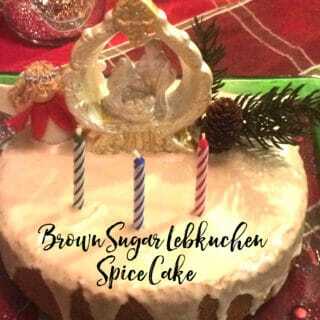 A moist brown sugar lebkuchen spice cake with a vanilla glaze. Even with me being sick, this cake is super simple to make and it was so good! Lebkuchen..to remind us of our vacation with our family in Germany, so earthy, warm, and just comforting. Gather all ingredients and equipment. Preheat oven to 375°F. Grease an 8 inch cake pan with the coconut oil. In the bowl of stand mixer fitted with the paddle attachment, cream the butter and brown sugar. Add the eggs and milk, mix well on medium speed. Scrape the bottom and sides of the bowl. Mix again. Add the salt, flour, baking powder, baking soda and lebkuchen spices. Mix on medium speed for two to three minutes. Pour the batter into prepared cake pan. Bake for 20-25 minutes or until cake tester comes out clean. Mix all the spices thoroughly together and store in an air tight container. Place the powdered sugar, corn syrup, salt, vanilla, and hot water in a large mixing bowl. Using a whisk, blend until the mixture is smooth and all of the sugar has been incorporated. Once the cake is out of the cake pan and cooled completely. Place the cake on a cooling rack over a sheet pan. Pour the glaze onto the middle of the cake. Glaze will drizzle over the edges. Allow to dry for 15 to 20 minutes. I miss Germany too! This cake is so moist and the flavors remind me of my visits!